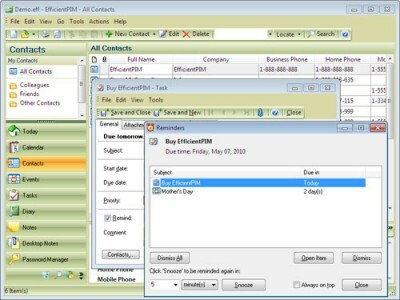 EfficientPIM 1.60 is pims & calendars software developed by EfficientPIM Software. EfficientPIM is a full-featured personal information manager that can help you manager your life. With EfficientPIM you can keep track of contacts, appointments, tasks, to-do lists, and much more. The software also gives you space for keeping notes, diaries, and even passwords. In order to be successful you need to be organized and efficient. With EfficientPIM all of the things you need to manage are located in one, easy-to-use interface. 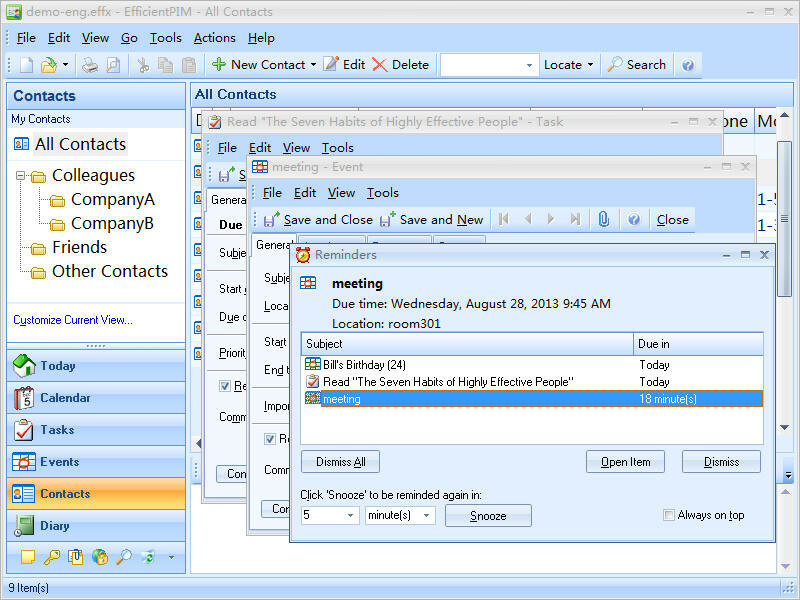 This program is shareware, which means you can download and use EfficientPIM 1.60 for free during 30-days trial period. After this period you gonna have to buy EfficientPIM 1.60 software for $39.95 or uninstall the program. EfficientPIM 1.60 supports English interface languages and works with Windows 98/XP/Vista. We have tested EfficientPIM 1.60 for spyware and adware modules. The software is absolutely safe to install. We has completely tested pims & calendars software EfficientPIM 1.60 many times, written and published the interesting article and uploaded installation file (3795K) to our fast server. Downloading EfficientPIM 1.60 will take minute if you use fast ADSL connection.